Authorities say a man and woman were injured when their elevated deck collapsed at their home in northeast Des Moines while they were grilling food. The Des Moines Register reports the incident occurred just after 5 p.m. Monday. Des Moines Police Sgt. Tina Kalar says rotted wood may have allowed the deck to fall away from the house. The 72-year-old woman was taken to a hospital for treatment of burns from the grill’s contents. Her 69-year-old husband was treated at an urgent care center. Copyright 2018 The Associated Press. All rights reserved. Read the original article here. “Your roof has a life expectancy. Your windows have a life expectancy. What about your deck?” Says Michael Beaudry, executive vice president of NADRA. Just like other products exposed to the environment, over time your deck will need to be replaced. Asphalt shingles have a life expectancy of about 20 years*. Aluminum and vinyl windows are expected to last 15-20 years*. Beaudry continues… “With more than 50 million decks in the U.S., it is estimated that 25 million decks are past their useful life and need to be replaced or repaired.” It’s important for homeowners to check their deck on a yearly basis. SKOKIE, Ill., May 3, 2018 /PRNewswire/ — Now that spring is here, everyone will want to enjoy their decks as much as possible. However, older decks or those with structural issues could be at risk for collapse, causing serious injury to you and your loved ones. The North American Deck and Railing Association (NADRA) is partnering with AZEK Building Products during Deck Safety Month® in May to promote deck safety. AZEK, a world leader in decking with the AZEK® and TimberTech® brands, recommends homeowners Check Your Deck® before those fun outdoor barbecues. Contractors can use a different color edge board to show a change in elevation as an extra safety measure. Shown: TimberTech Antiqua Gold with Antigua Palm accent. Check out NADRA’s “10-Point Consumer Safety Checklist” for tips on making decks safer at www.NADRA.org. Or, to learn more about AZEK Building Products, visit www.azek.com. CAMO Edge Fastening teams with the North American Deck and Railing Association, Inc. (NADRA) to promote “Deck Safety Month®” with ways to improve the safety of your deck using better installation techniques and materials. CAMO Edge Fastening joined forces with the North American Deck and Railing Association, Inc. (NADRA), in supporting Deck Safety Month® in May to help increase public awareness of the necessity for regular inspection and maintenance of existing decks, and proper installation of new decks. National Nail’s CAMO Edge Fastening is one technology that can help contractors make decks safer for homeowners. Another safety advantage to CAMO Edge Fastening is the holding power of the deck board is greatly improved due to the angle which the screws enter the deck board and attach directly to the sub-structure. This system virtually eliminates deck board movement which is a common problem with deck clips. “With CAMO, you get a solid, stable board. If there is ever an issue with a board I can back the screws out to replace it where I can’t with typical hidden clips,” said Billy Lecorchick, owner of Legends Home Improvements in Monroe, NJ. To learn more about deck safety, visit NADRA’s website at http://www.NADRA.org for their video and Check Your Deck® – 10-Point Safety Checklist. For more information about CAMO Edge Fastening visit http://www.camofasteners.com. CAMO Edge Fastening™ from National Nail delivers beautiful, fastener-free, Barefoot Approved™ results with virtually any wood, composite or PVC decking. CAMO® offers a variety of guides, fasteners, and accessories, as well as a collated system to suit project requirements. For more information or to locate a dealer, visit CAMO Fasteners or call 1-800-968-6245. Be sure to “Like” CAMO® Fasteners on Facebook. This is a great time to market your business and remind homeowners to “Check Your Deck®” to ensure its safety. How do we do this? NADRA rolls out a plethora of marketing materials for its members to use to promote deck safety awareness (like the 10-point consumer checklist & PR templates). What better opportunity to call up local news stations, send out press releases, or offer a promotion and get your community involved with a Check Your Deck® campaign. At NADRA HQ, interviews are coming in left and right as columnists are talking about making outdoor living improvements to those backyard havens & making sure they are safe for family and friends. We at NADRA are doing our part by directing calls and inquiries to our membership directory, and have seen a spike in traffic in the first 9 days of May to the “Find a Builder” and “Find an Inspector” section of NADRA.org. 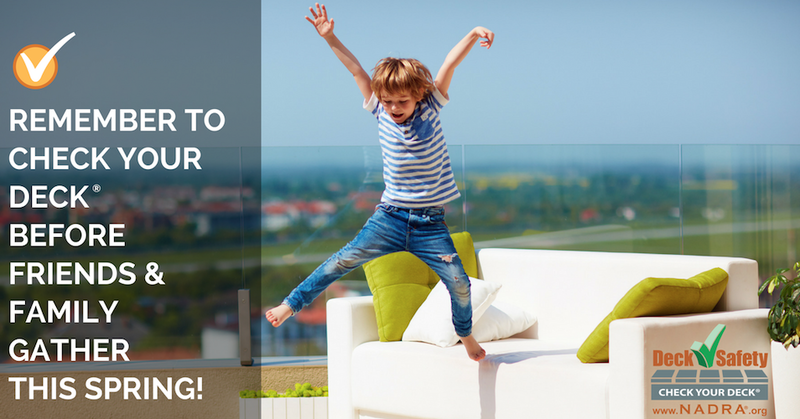 Market indicators continue to suggest we are positioned to have a busy year- here’s to a fun and safe outdoor living season. For my Canadian friends, that’s July. Just kidding. Have a great year! Bob Lett is VP of National Sales for Wolf Home Products. He is a NADRA member and is Secretary for the NADRA Board of Directors. During Deck Safety Month® and throughout the year, homeowners can take advantage of resources and tools from the North American Decking and Railing Association to ensure the security and longevity of their decks. Quakertown, PA (May 1st, 2017) – May is Deck Safety Month ® , the perfect time for homeowners to ensure their decks are in top condition for the season ahead. 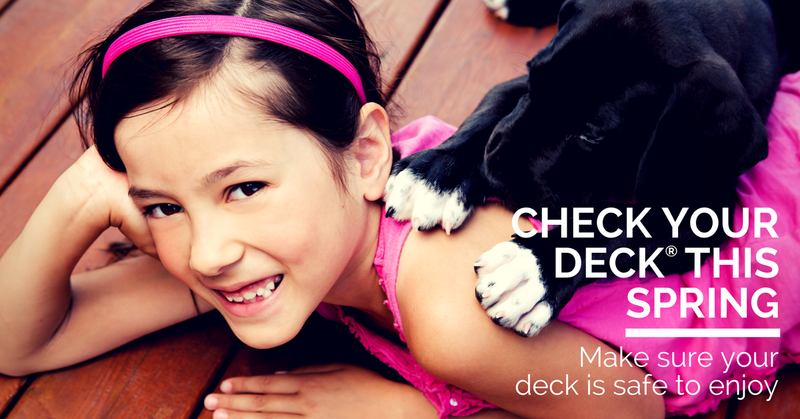 The North American Decking and Railing Association (NADRA) invites consumers to Check Your Deck ® using resources such as the 10-Point Consumer Checklist. 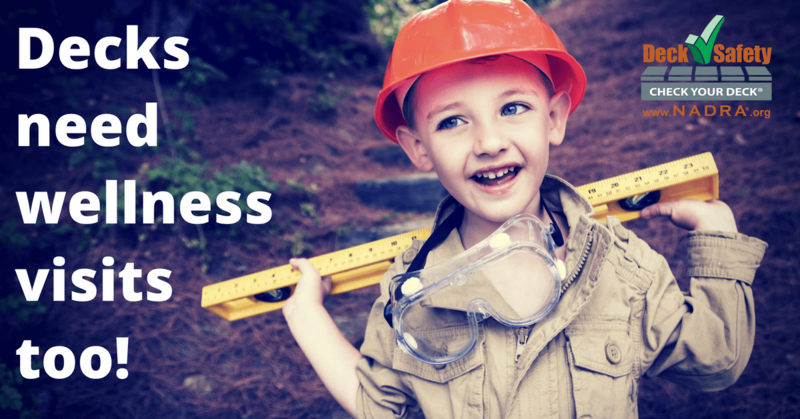 Visit www.NADRA.org to access all of NADRA’s Deck Safety Month® resources. In honor of Deck Safety Month ® , the North American Decking and Railing Association reminds professionals to take advantage of exclusive safety resources along with press release templates, graphics, ads, social media content, flyers, and more. Quakertown, PA (April 28th, 2017) – The United States is home to roughly 40 million residential decks, and of those it’s estimated that half are more 25 years old. This means big business opportunities for deck builders, remodelers, inspectors and contractors to promote deck inspections, ensuring homeowner safety while simultaneously building their own brand. The North American Decking and Railing Association (NADRA) offers industry professionals and inspectors a breadth of resources, including a comprehensive toolkit, marketing materials, and inspection checklists. Visit www.NADRA.org to access all of NDRA’s Deck Safety Month resources for industry professionals. *You must be a current NADRA member to access the “toolkit”. Join NADRA today.